The Atomos Shogun Flame recorder allows filmmakers to shoot exactly as their eyes see without compromising on quality. With a 7" 10-bit AtomHDR 1500nit monitor with recording capabilities of 4k/HD 10-bit ProRes/DNxHR, this camera comes as a solution for shooting at locations with exposure challenges. The Shogun Flame allows for natural and vibrant colors with it bright and dynamic range of the HDR Log. The camera offers flexibility in its recording as it can record Sony & Canon Raw to ProRes/DNxHR, professional HDMI, XLR and SDI as well as popular on-set and broadcast conversions including bidirectional SDI/HDMI and LTC/Genlock. 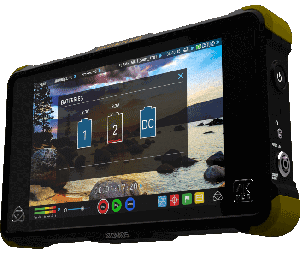 The Atomos Shogun Flame comes with a wide range of video tools and an optional calibration of the LCD to allow for precision of shots for varying conditions. Different scenes may not qualify for HDR log recording but the Shogun Flame, coming with 1500nits of light makes every situation qualified for ten stop dynamic ranges by brightening the condition. To get the most form 10-bit processing Shogun Flame with a resolution of 1920x1200 and a 325-pixel density, you need to select the right mode for the scene either between High Bright and HDR. The Atomos Shogun Flame comes with a dynamic range of 10+ which is what High Dynamic Range (HDR) requires. With this 7" 1500nit monitor, you will be assured of a resolve for HDR as the monitor captures a moment as the eyes see it and provides you direct from its sensor an original Log image which can be used for post-production. The Atomos Shogun Flame comes with a built-in armor of accessories that makes the monitor ready for instant field recording. The camera comes with a premium HPRC flight case that makes it easy to pack and carry the camera together with some of its other accessories including a fast battery charger, DC to D-tap cable, HDR sun hood, 2 x NP Series 4-cell batteries, a USB3 docking station, Lanc cable, DC adapter and XLR breakout cable. The Shogun flame recorder comes with an easy-to-use preinstalled OS. The OS is particularly important for focusing, de-squeezing content (anamorphic), framing and exposure ( including Safe Area, vector scope, Zebra, Focus Peaking, 2:1/1:1 zoom and Luma/RGB parade) as well as a flexible, in-built3D LUT implementation (you can also upload .cube files). All these functionalities are one touch away, and this makes this camera a convenient alternative for fast shooting. The Atomos Shogun Flame recorder integrates the Atomos patented fast charging system used by Atomos HD products within the 4K range. The system also allows for swapping between the dual batteries. As soon as the first one is detected low, the camera draws power from the second battery meaning that continuous power during on-set shooting is guaranteed. With the extremely fast battery charging system, you can recharge the battery, not on use within a short time span meaning that there are not interruptions during shooting. The Atomos Shogun Flame comes with unit recording functionalities not easily found with other camcorders. With this model, you can control the start/stop of recording over different selected models of Nikon, Canon, Panasonic and Sony recorders through the use of HDMI. Take advantage of different functionalities such as the Pre-roll, which ensures for cache recording hence an action could not be missed and Time-lapse, which allows for creativity. These advanced functionalities can be gained through conversion of interlace video from your Shogun Flame to progressive with the available 3:2 and 2:2 pull-down system. The Atomos Shogun Flame uses SDI and HDMI to connect with almost every camera type allowing for bi-directional conversion using the in/out feature. You can also use this recorder to unlock Output Raw from some selected cameras and record directly to DNxHR or 4K/HD. With the Atomos Shogun Flame recorder, you can record high-quality audio as well as videos, externally. The model comes with an 8ch HDMI audio system and a 2ch analog line for use by audio meters. Leaders in off camera video capture technology; Atomos has launched a worthy successor to the original Shogun in the form of Atomos Shogun Flame. As a monitor recorder, the Atomos Shogun Flame truly stands a class apart, equipped as it is with 1500-nit 10- bit panel apart from a host of other advanced technology features. The new Atomos Shogun Flame recorder not only addresses some of the issues that plagued the earlier Shogun but also takes a giant leap forward in terms of monitor performance. • One of the biggest selling points of the Atomos Shogun Flame is the 1500 nit panel which allows for Daylight Viewable display. • One of the biggest grouses while shooting in daylight is the loss of view ability, sometimes even a sun hood does not provide enough shade to be able to view the shot perfectly through the camera monitor. • At least four times brighter than any other model currently existing, the Atomos Shogun displays images not only with extreme brightness even in peak daylight but with extreme clarity and detail as well even when you are not shooting in HDR mode. This in addition to its professional 4K/HD ProRes/DNxHR Recording, Playback and Editing that makes for a formidable combination. • Another feature that distinguishes the Atomos Shogun Flame from the others is the AtomHDR image processing engine. • Video operators regularly struggle with missing details and flat images while viewing the log feed from the camera on the monitor. The new ATOM HDR image processing engine makes it possible to display 10 stops of dynamic range to match 10-bit Log footage from cameras, adding not only contrast and vibrancy but also revealing details in shadows and highlights that normally get clipped on other monitors. The Shogun Flame log format is designed to support a wide range of cameras including Sony, Arri, JVC, Canon, Panasonic and Red and is especially useful while shooting in S-log which already produces log profiles that are super flat. Audio quality is also greatly enhanced with the addition the XLR audio inputs and outputs. The one feature that has endeared the Atomos Shogun Flame to videographers is the two battery slots that are also swappable. This means that videographers no longer have to suffer through a shoot interruption due to the need for battery replacement. This along with a battery charger that is almost three times faster than most standard chargers allows for long hours of shooting without interruption, minimizing delays and increasing productivity. The batteries are also sturdier to provide greater protection during outdoor shoots, which is always a good to have feature. Unlike the earlier version, the Atomos Shogun Flame supports both HDMI and SDI and also allows for conversion from one to the other. Cinema DNG recording file format is now available on the Shogun Flame. To access this format, open the Record Format page and select Cinema DNG from the codec options and press OK.
Cinema DNG is supported on Sony, Canon and Panasonic cameras. Playback of Cinema DNG files is not supported.